Under the current healthcare system, many women have become a medical underclass. So why do so many oppose a healthcare overhaul? 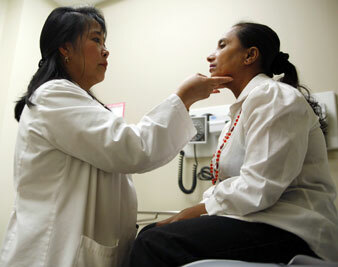 Rulour Torio, MD (examines Pabitra Timsina, a refugee from Bhutan, at the El Franco Lee Health Center in Houston, Texas. To be sure, no group is doing well under our network of private insurers, which is more holes than net. But women fare particularly badly in terms of health, being more likely than men to leave a prescription unfilled; forgo seeing a needed specialist; and skip a medical test, treatment or follow-up. Financially, women are worse off, too, in large part because they earn less money. Despite the fact that they skimp on their care to cut costs, three in five women are still unable to pay their medical bills. All of which makes it surprising that men and women support health reform in almost equal numbers (38 versus 40 percent consider it a top priority, according to a recent Kaiser poll). Odder and ickier still is the sight of Sarah Palin, Betsy McCaughey and other women leading, or sometimes blindly following, the wacko town hall movement against reform. Many of women’s problems stem from the fact that to get anything close to decent private insurance, you usually need a full-time job, which women are less likely than men to have–52 percent versus 73 percent. (The flip side of this problem is that linking jobs to insurance leaves many women tethered to full-time jobs they’d rather not have, given their other responsibilities. In fact, 60 percent of full-time working mothers would prefer part-time work, according to a 2007 Pew poll. While some keep their full-time jobs for the income, many others stay because they have no other way to get health benefits.) Many women who work part-time or stay at home have become a sort of medical underclass, stuck without insurance, paying dearly for it out of their own pockets or, as was Jemilla Mulvihill’s experience, begging desperately, and unsuccessfully, for the opportunity to pay dearly for it out-of-pocket. A 38-year-old yoga instructor and personal trainer, Mulvihill was uninsured when she recently discovered she was pregnant. She had made do without coverage throughout her adult life, relying mostly on luck and over-the-counter remedies. This time, she knew she needed something more. Even without the cost of prenatal care, a standard in-hospital delivery typically runs between $7,000 and $10,000. If anything went wrong, the costs would be way higher. So Mulvihill resigned herself to buying private insurance, hoping to put it on a credit card and pay it off at some point in the distant future. Yet, after spending hours calling private insurance companies, she found none would take her. The reason? Private insurers can legally reject pregnant women on the grounds that their pregnancy is a pre-existing condition. While federal law forbids group health plans from playing this sleazy trick, on the individual market, companies face no such restriction. Given the loophole, seemingly all insurers jump through it. Even though not getting prenatal care is a technically a violation of the law (according to family law experts, women could be prosecuted for neglect, though they rarely if ever are), private insurance plans for individuals aren’t required to help them get it. When looking for real help, many uninsured pregnant women encounter this utterly useless advice: get a policy before conceiving. Yet planning ahead doesn’t necessarily solve women’s insurance problem. Many women couldn’t afford whatever care they find, since companies often charge women more–in one case as much as 140 percent more–for the same health coverage, according to a 2008 study by the National Women’s Law Center. And only the lucky have the privilege of paying even these high prices, since companies can simply reject women for anything from having been subject to domestic violence to having had a C-section. Meanwhile, the vast majority of individual plans don’t even offer maternity coverage. Only 7 percent of women get insurance through the individual market, yet its unwelcoming practices clearly contribute to the fact that another 18 percent are uninsured. Ameriplan, a huge multilevel marketing company, capitalizes both on women’s overall lack of health insurance and their need for part-time employment by setting up work-from-home businesses selling “discount medical plans.” (According to the company’s website, the fact that seven in ten Americans is either uninsured or underinsured “presents the opportunity of a lifetime!”) Unfortunately, women haven’t had much luck either selling or using the cards. In 2006, the Montana State Auditor sued the company, charging that it didn’t actually hold up its end by contracting with local healthcare providers, leaving the Montanans who bought discount cards from the company out of luck–and their monthly fee, which ranges up to $59.95. Ameriplan gave the state $200,000 as part of a settlement of the suit, which charged the company with conducting a pyramid scheme, in addition to engaging in insurance and securities fraud. Healthcare reform shouldn’t harm Trig Palin, as Sarah Palin has suggested it might, but it would put a knife through the hearts of the bottom-feeding companies that prey on uninsured, pregnant women. By forbidding real insurers from denying coverage on the grounds of pre-existing conditions, as four of the five proposals now floating around the various Congressional committees would, reform should eliminate pregnant women’s desperate search for coverage. Most of those bills would also outlaw the practice of “gender rating,” or charging women more for the same policies, though the Senate Finance Committee version would reportedly allow insurers to charge companies with more than fifty employees more for women. It’s still unclear how much money the government would offer to help pay for insurance premiums and out-of-pocket costs. Since women still struggle more to cover these expenses, the size of the subsidy will determine whether they’ll really be able to afford the insurance they’ll be required to buy. The biggest question of all, of course, is still whether any version of health reform will pass. In part, the answer will rest on whether women remain silent or, worse, contribute to the twisted version of events offered by groups like Concerned Women of America and (the sadly co-ed) Conservatives for Patients’ Rights. The best hope for the more than half of women who are uninsured or underinsured would be to lend their support to groups like the National Partnership for Women and Families, the National Women’s Law Center and Moms Rising, who are actively fighting for reform–and against the misrepresentation of women’s experience. If they don’t, women’s prognosis for escaping the medical underclass–and the sleaze that comes with it–is grim.